Beach Week was in the air we breathed. These elites, and the corporate system they serve, have ruined the country. Sep 28, 2018 | The most prominent entry in Brett Kavanaugh’s now overly-dissected, perfectly preserved 1982 “calendar-diary” from his senior year at Georgetown Prep is boy-scrawled over June 6th to June 11th: B E A C H W E E K.
The event is marked in all caps and traced over multiple times for emphasis. It’s clear that this is an important week for young Kavanaugh. So important that he immortalized it in his yearbook as well, with the entry “Beach Week Ralph Club” (the entry “Rehoboth Police Fan Club” is Beach Week related, too). Anyone who grew up in the DC area, particularly those who grew up in its white privileged enclaves, knows why Beach Week took on such significance for Kavanaugh: the high school tradition was and continues to be (at least since we last checked) a booze- and drug-fueled free-for-all where prep school almost-grads go to black out for one full week, frequently leaving a path of destruction in their wakes. Joanna Rothkopf is deputy editor at Esquire.com. Previously, she wassenior editor at Jezebel. Leah Chernikoff oversees all things digital at ELLE. She came to ELLE from Fashionista.com, where she was the editorial director. Before that, she was a reporter at the New York Daily News. A Washington, D.C. native, Leah graduated from Bowdoin College with a degree in English Literature. These elites, and the corporate system they serve, have ruined the country. And when it all collapses, when our rotten financial system with its trillions in worthless assets implodes and our imperial wars end in humiliation and defeat, they will be exposed as being as helpless, and as stupid, as the rest of us. Dec 08, 2008 | The multiple failures that beset the country, from our mismanaged economy to our shredded constitutional rights to our lack of universal health care to our imperial debacles in the Middle East, can be laid at the feet of our elite universities. 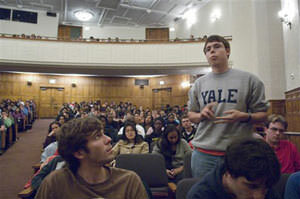 Harvard, Yale, Princeton and Stanford, along with most other elite schools, do a poor job educating students to think. They focus instead, through the filter of standardized tests, enrichment activities, advanced placement classes, high-priced tutors, swanky private schools and blind deference to all authority, on creating hordes of competent systems managers. The collapse of the country runs in a direct line from the manicured quadrangles and halls in places like Cambridge, Princeton and New Haven to the financial and political centers of power. The nation’s elite universities disdain honest intellectual inquiry, which is by its nature distrustful of authority, fiercely independent and often subversive. They organize learning around minutely specialized disciplines, narrow answers and rigid structures that are designed to produce certain answers. The established corporate hierarchies these institutions service — economic, political and social — come with clear parameters, such as the primacy of an unfettered free market, and with a highly specialized vocabulary. This vocabulary, a sign of the “specialist” and of course the elitist, thwarts universal understanding. It keeps the uninitiated from asking unpleasant questions. It destroys the search for the common good. It dices disciplines, faculty, students and finally experts into tiny, specialized fragments. It allows students and faculty to retreat into these self-imposed fiefdoms and neglect the most pressing moral, political and cultural questions. Those who defy the system — people like Ralph Nader — are branded as irrational and irrelevant. These elite universities have banished self-criticism. They refuse to question a self-justifying system. Organization, technology, self-advancement and information systems are the only things that matter.